Jeanette Nee shows her love of the outdoors as she pulls up the handbrake on her little Toyota RAV4 for me to capture one last photograph of her Ohauiti farm with the sun setting on the horizon. The 75-year-old Canadian – who has made Ohauiti home for the last 50 years – usually hunts alone. Born and raised on Vancouver Island, Canada, she grew up hunting with her father Harry Campbell and three siblings – she’s never put down the gun since. 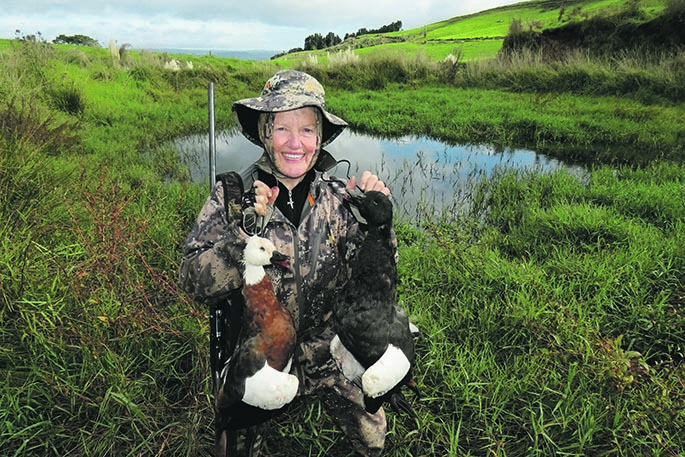 Today she hunts “anything you can put on the table” – duck, pheasant, rabbits, hares, deer, pigs – on her farm and around the Western Bay of Plenty, enjoying the outdoors that hunting game affords. “We got DNA-tested and apparently I’m 20 per cent Viking and five per cent Native American Indian,” roars Jeanette with laughter. Her first paid job was a laboratory technician at the Horitiu freezing works “which was very interesting”. When she took up nursing, nurses were advised to learn skills for self-defence – she met future husband Graeme Nee at judo in 1965. “I was the only women who could throw him so he decided I was an interesting piece of work,” chuckles Jeanette. They married in 1968 and moved to Graeme’s family farm up Ohauiti Rd. Graeme was dairy farming while Jeanette was nursing; and they had daughter Janelle, who runs the farm with her partner. Jeanette and Graeme are retired so to speak – but really they never sit still. Graeme does tractor work on the farm to help out, or is bagpiping, while Jeanette spends her time hunting or photographing wildlife and the outdoors. Her cat Cheeta is more than 7kg and only eats rabbit. Her rough collie Charlie was her hunting companion but has been retired due to back injuries and old age. So what’s the knack of duck shooting? “There’s no perfect conditions,” laughs Jeanette, who owns a custom-designed 20 gauge shotgun. Jeanette says duck hunting is a culture. “It revolves around a game plan – you’re getting exercise, you’re part of understanding the balance of nature. Jeannette says Graeme is much better behind a shotgun than her, but it’s not his cup of tea. Daughter Janelle is too busy running the 120-cow farm and working full-time as Tauranga Vets’ practice manager. She also hunts to provide food for an annual game dinner with neighbours and the rural community up Ohauiti Rd and Rowe roads. “They put a pig on the spit, Graham plays the bagpipes; we have a few beers down by the stream. It’s a beautiful setting.” Jeanette’s bagging ducks for it now. Jeanette’s other love is capturing wildlife and the outdoors on film. Ten years ago she took up photography and joined Tauranga Photographic Society. Currently she’s trying creative photography “but I’d rather have a bird fly in front of me”. So it’s a battle between gun and camera. “Hunting gives me fresh air, exercise, a mission – you don’t have to shoot anything it’s just getting out there, knowing where they are, and enjoying being on the land.